At MSL, we are big fans of the stacked “bracelets, bangles and baubles” look, and recently we discovered a new way to rock this trend that puts us in touch with our bohemian side. 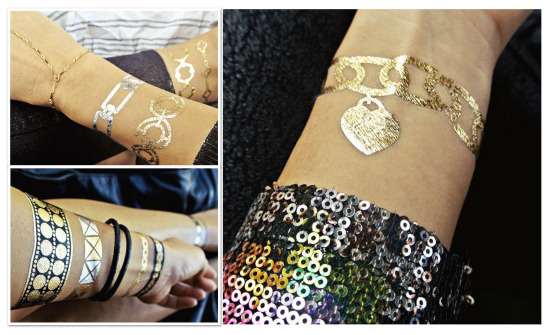 Worthy of a street style star, temporary jewelry tattoos are a fresh and inexpensive way to add bling to your look! And there’s no commitment. We especially like the bracelet tattoos and love to mix them with actual bracelets. This provides a three-dimensional look and is a grown-up version of the party tattoos that our kids love to sport. Even better, these tats stay put for a few days or you can remove them at any time with baby oil. We predict your friends will all be asking where you got them. They’re fun to add to your accessory mix for the weekend, especially as we say “so long” to summer — or keep them on hand in your beach vacation arsenal.